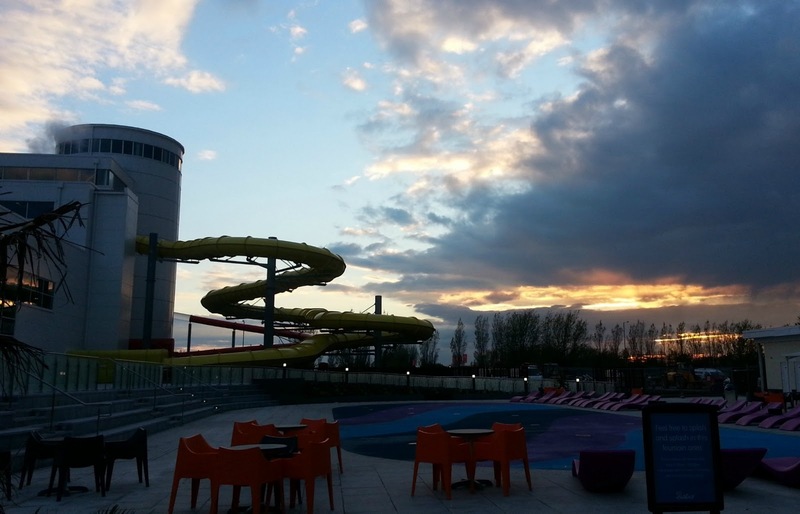 My sugar coated life...: Butlins Skegness - our family adventure! 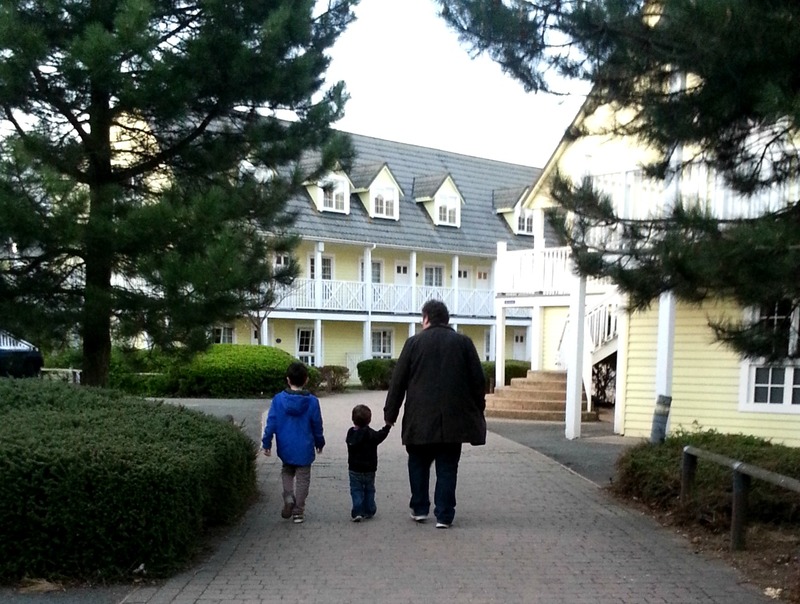 A few weeks ago me and my little family took a family holiday to Butlins Skegness. A LOT of people have asked my opinion on various elements of the holiday so I thought I'd share our family review of our fun time away - it's a detailed review so in Miranda style 'bare with! bare with"
This was my 2nd trip to the Skegness Butlins resort, our first trip was back in July 2010 (about 3 days before Milo was born!) and we loved it on our first visit! It's been 3 years since we enjoyed any family getaway and I knew that if we got the chance to go back then I'd definitely take the boys as I think it's a great getaway for any young family. Typically, the weather was being very British so although we had some sunshine it was unseasonally cold. This didn't impact on us too much as there is so much to do that we didn't really notice but I'm glad I packed warm coats! I love it when you arrive as the red coats are out in force to wave to everyone entering the park on check in day. There was also a few characters and a man on stilts there to keep the kids entertained if there was a traffic build up. This really got the kids excited! As soon as we entered my heart dropped - we literally drove through a small building site where the waterworld expansion is being finished off. I wish we had been told there was some ongoing work as although it did not disrupt our holiday in anyway (there were a few builders around and some scaffolding) I immediately had worries of building noise getting us up at 7am! Luckily, there was no such noise or disruption but it might be good to warn holiday makers that there's nothing to worry about. We entered the park around 12pm and checked in immediately using the new drive through check in. It was super quick and allowed us to park up and explore the resort before we got settled in the room. I had high expectations of the room as I remember it being lovely and modern from our last visit. This time we were on a middle floor (gold accommodation has 3 levels). The accommodation was clean and functional but I would say it was starting to look a little tired. Paint was peeling off the outside of the chalets and the inside just feels a *little* dated. As soon as we opened the curtains we saw an egg had been thrown at the window (obviously been there a day or two) and whilst I did mention this to our gold reception straight away (as it was an eyesore) nothing was done about it for the duration of our stay. Also, being on a middle floor can be noisy if you have loud neighbours so I'd request a top floor next time as the kids were woken up each day by noise. The park itself is well laid out and the red coats are constantly on hand if you need anything. The kids were so excited about the new splash waterworld so that was our first stop! It really is a great pool for kids of all ages and I love how people not swimming can sit and have a coffee poolside meaning you don't all have to venture into the water if some of the family are non swimmers. My son immediately wanted to ride the new family raft slide so we ventured up and joined the queue. We were queueing for 45mins before we got to ride on the slide due to the lift for the rafts being REALLY slow so once the rafts hit the bottom it takes about 3mins for the 3 rafts to reach the top of the slide meaning a VERY long wait. The staff were fab and very apologetic about this so I hope this is fixed soon as even they seemed to be losing patience with it. It was worth the wait though and I loved how me and the kids could ride it as they're not confident swimmers but being in a raft keeps them out of the water. You can book swimming lessons for the kids and buy any swimming items you've forgotten on site but don't forget your waterwings or swimming ring! 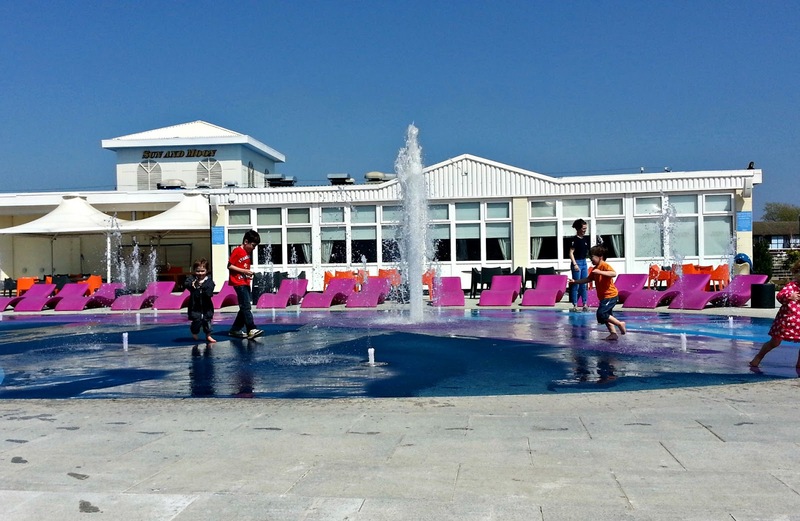 The new wet area was sooooo much fun for the kids!! We decided to go self catering so we took lots of food with us which really did save us money. There is a large variety of food options on site but of course they're a little pricey as you'd expect from any holiday resort. We ventured off resort one evening to get some chips at the seaside but that's it. If we could afford it I'd probably get the all inclusive meal plan next time as I did feel a little tired each day and cooking wasn't my favourite task but the kitchen is well stocked and we even got a dishwasher so washing up was minimal! The premium dining looked LUSH and I might have been caught staring a little too longingly at their food options through the window...lol! The activities for the boys was plentiful and you get a handy timetable when you check in which lists it all out for you by time and venue. Milo is nearly 3 and he loved all the characters on site! Thomas the tank engine, Fireman Sam, Bob the Builder etc were all doing morning shows in the pavilion so he was easy to entertain. My eldest is 8 and it was a little harder to entertain him. We paid for him to have a few games of quasar which he loved but as we holidayed in school time the activities for slightly older kids is a little more limited so if we went again I think we'd need to consider what is available for him. He was great though and rode all the little rides with his brother and as long as we went to the pool and arcades once a day he was happy. One day, on the walk to the pavilion we were walking behind 2 managers from Butlins who were chatting about work stuff when all of a sudden they started picking up rubbish as they were walking along. This really impressed me as even though they were suited and booted they didn't overlook their immediate surroundings and obviously took pride in what they do which was lovely to see. The grounds were generally very clean and tidy and now I can see why. (which we don't enjoy doing in front of the kids) and play on arcades. Now, this is MY gripe as the kids loved playing the 2p machines and buying sweets from the candy store but I do wish the rides and pool were open a bit later as I would have loved to take Milo on the rides in the evening. Maybe they are open longer in summer months? I'm not sure. The kids were shattered every night either way but you can't even access the beach after 5pm so the evening strolls on the beach I'd envisaged were a non starter unless we left the site. I wish I could have strolled on the beach after 5pm! 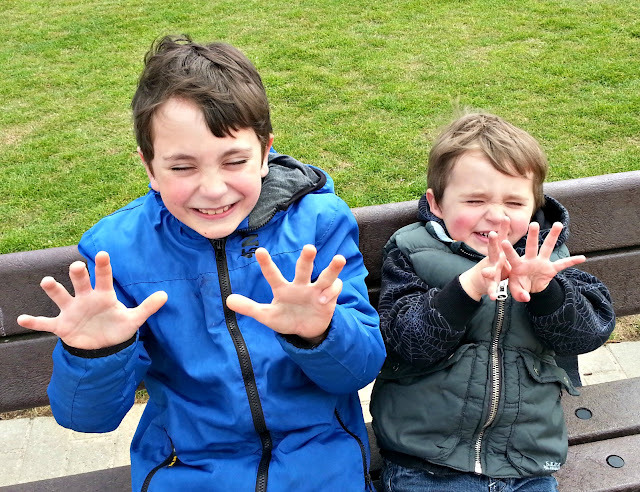 By the end of the holiday I asked the boys to give their ratings on their stay and as you can see - they loved it! Although I had a few minor niggles from our stay I'd probably go again. We bought a fab deal in January for our stay in May as it can be pricey so it's worth checking their site and twitter feed for deals. The ladies who run the twitter feed are great for answering quick questions and a great example of social media done well. All in all I would recommend it but I think gold accommodation needs to raise its game. I kept it in perspective when I realised we paid less than £45 per night for a family holiday with sooo many optional extras which is less than I'd pay for a family room at a budget hotel so I really shouldn't grumble too much! 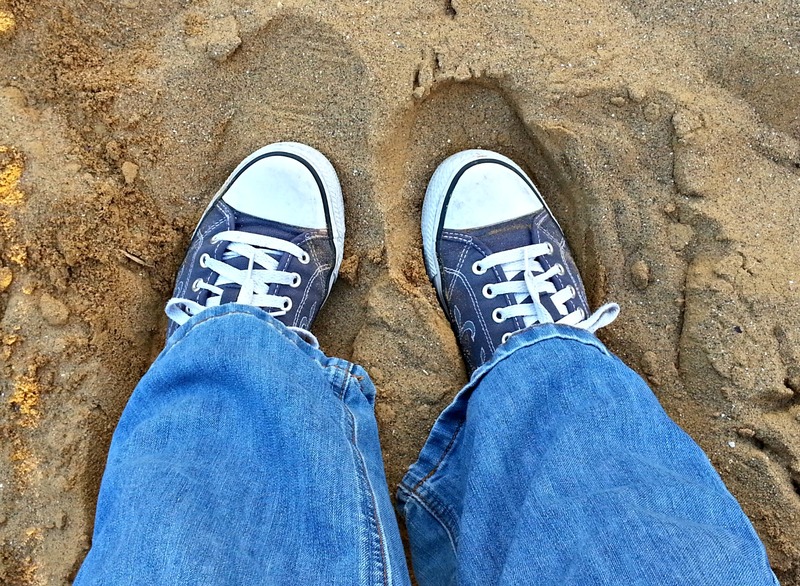 We can only afford a family holiday every few years so maybe my expectations were a little high ;) My kids loved it and that's really all that matters - they were worn out from their holiday and they still talk about the fun they had a few weeks after we've returned! 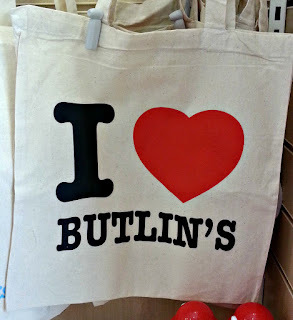 NB: this post is NOT sponsored by Butlins and represents my own views from my holiday! Oooh, has your Milo outgrown the terrible 2's yet?? Lol! 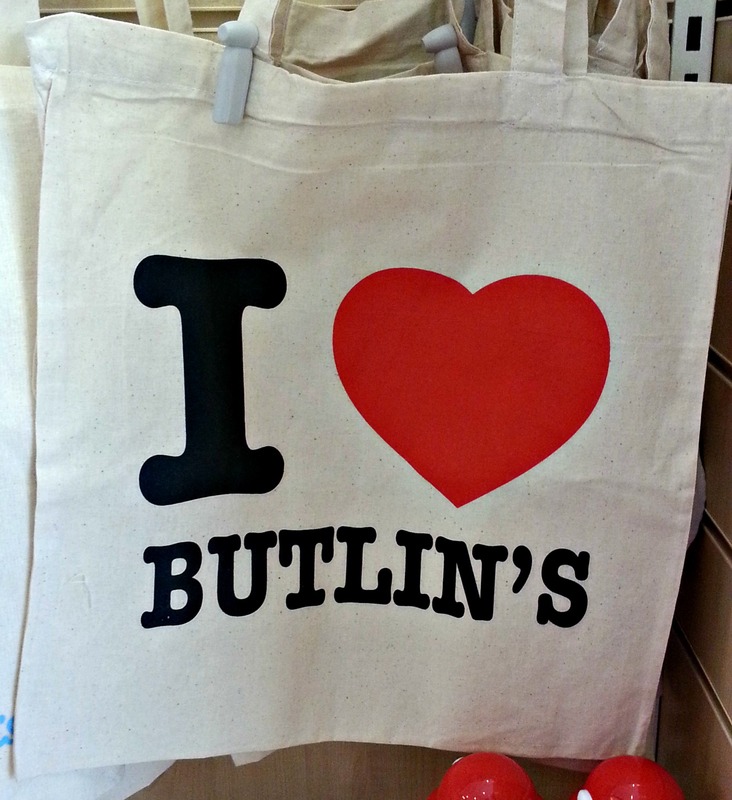 Very interesting to read - I'd not really thought of Butlins as a place to go before but wouldn't necessarily rule it out. What is the entertainment like for adults in the evening,? The entertainment changes throughout the season but they have a few venues for various family shows, bands etc so it's a nice variety. They had the tribute bands for Jackson 5 and The Rolling Stones when we went - they were both on after 10pm and they're in the bar area so it's nice and convenient. They have weekends for adults only now so those would be better if you weren't bringing the kids I'd imagine?